Just a note to let anyone reading this know why the History column is not up to date. I’m working on two new stories right now, so I really don’t have the time to work on that column. I hope to get back to it at some point in the future, but for now, I am going to concentrate on my writing. 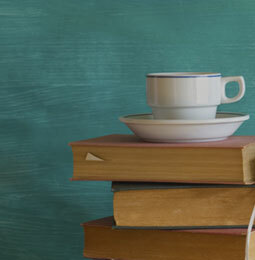 Talk to you later as these stories reach their conclusion! Abilene, Kanasas, was a burgeoning Cowtown. The county itself, Dickinson County, had only come into existence in 1857. A stage coach stop was built by Timothy Hershey that same year, and was Mud Creek began as a stage stop that same year and due to the landscape, it was given the unlikely name of Mud Creek. In 1860, it was renamed Abilene, and the name was taken from a passage in the Bible (Luke 3:1), meaning “city of the plains”. Cottage. He also put together a set of stockyards equipped for 2,000 head of cattle, and a stable for their horses. Why did he invest here? Because he was a smart man. In that same year the Kansas Pacific Railway (Union Pacific) had pushed westward through to Abilene. The Kansas Pacific put in a side-track switch at Abilene that enabled the cattle cars to be loaded and sent on to their destinations. The first twenty carloads left September 5, 1867, on their way to Chicago, Illinois, where McCoy was quite familiar with the market. The town grew quickly and became the very first “cow town” of the west. McCoy encouraged Texas cattlemen to drive their herds to his stockyards. From 1867 to 1871, the Chisholm Trail, a trail used by many cowmen to herd their cattle to market, ended in Abilene, and this convenient location brought in many travelers and very quickly turned Abilene one of the wildest towns in the west. According to records, 35,000 head were sent on their way east in 1867 and this allowed Abilene to become the largest stockyards west of Kansas City, Kansas. Another reliable resource declared that 440,200 head of cattle were shipped out of Abilene from 1867 to 1871. How-ever, in just four years, this total jumped to between 600,000 and 700,000 cows coming in to Abilene and other Kansas railheads, a 35-40% increase in traffic. This represented a tremendous boom in Abilene’s economy, but it came at a price. These cows didn’t come on their own, and that mean men were needed to move them. After four to six months on the trail, with no liquor or women, when the men arrived and were paid off, they wanted to howl at the moon. This allowed for a lot of opportunities for gamblers, pickpockets, saloons and painted ladies to make a killing as well. And to prevent the other kind of killings, a strong and effective lawman was needed. 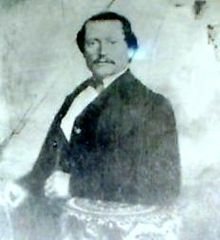 Marshal Tom “Bear River” Smith. he tamed towns with his hands. 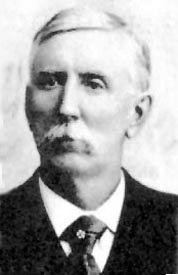 was standing off a crowd during a street brawl, a gambler named Phil Coe took two shots at Hickok, who returned fire, killing Coe. Phillip Houston Coe, gambler, gunfighter, and partner with Ben Thompson. He tried to shoot it out with Wild Bill Hickok and lost. There had been bad blood between them for some time. But Hickok then accidentally shot his friend and deputy, Mike Williams, who had come running up from behind in a desire to help his friend. Running up be-hind Hickok was a smart move at any time, as Hickok was known to shoot to kill. Hickok lost his job two months later in December. It was the beginning of the end for Wild Bill, as his eyesight was already beginning to fail, possibly from an STD. He never drew his pistol on another man for the rest of his life, which was only five years and four months. traveling with them at the time. On August 2, 1876, Hickok was playing poker at Nuttal & Mann’s Saloon in Deadwood, in the Black Hills of the Dakota Territory. Hickok usually sat with his back to a wall. The only seat available when he joined the poker game that afternoon was a chair that put his back to a door. Twice he asked another player, Charles Rich, to change seats with him, and on both occasions Rich refused. 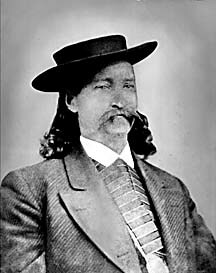 A former buffalo hunter, Jack McCall (better known as “Crooked Nose” or “Broken Nose” Jack), entered the saloon unnoticed by Hickok. Jack “Crooked Nose”, or “Broken Nose” McCall. 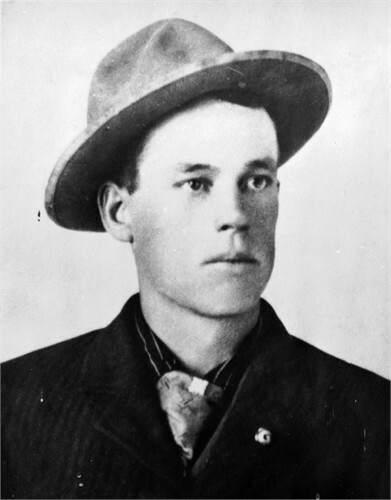 He shot Wild Bill Hickik in the back of the head, and was later hanged for this killing. McCall walked to within a few feet of Hickok, drew a pistol and shouted, “Damn you! Take that!” before firing at Hickok point blank. 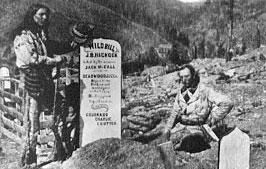 McCall’s bullet hit Hickok in the back of the head, killing him instantly. The bullet emerged through Hickok’s right cheek, striking another player, Captain Massie, in the left wrist. The murder weapon was an 18 inch “Sharps Improved” revolver. Hickok was playing five card draw when he was shot, and was holding a pair of black aces and a pair of black eights. The final card had been discarded and its replacement had possibly yet to be dealt. The fifth card’s identity remains the subject of debate. Today In Western History: The Ocobock Bank Is Robbed! It started off as a good day for the people of Corydon. Everyone was at church to hear a speech promoting the railroad coming to town, which everyone knew also meant the coming of prosperity. The speaker was to be the well-renowned orator, Henry Clay Dean. Coincidentally, a few days ago had seen the arrival of four “cattle buyers” in the Lineville area, so people paid scant attention when those same four men, this time wearing linen dusters, rode into town on the day of the meeting. They happened to come in from the northeast corner of the town square, which just happened to be the location of the Wayne County Treasurer’s Office. The office was full of money from the tax collections that had just finished earlier that week. The lone clerk on duty was approached by one of the men, who asked him to make change for a $100 bill. Because everyone else was at the rally, the ever helpful junior clerk suggested the men go down to the Ocobock Bank, thus unknowingly saving himself a lot of grief all the tax receipts. The man thanked him and they left. 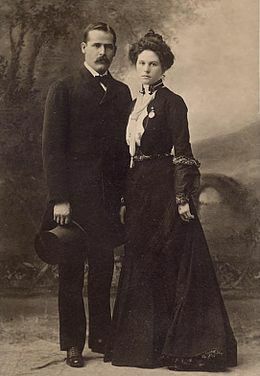 Cole Younger and Clell Miller. 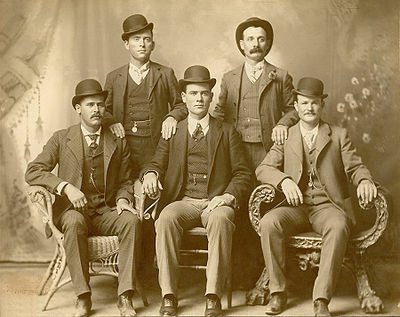 Townsfolk soon realized the bank had been robbed by the infamous James-Younger Gang. The treasurer’s clerk had given Jesse James directions to the bank! They quickly formed a posse and pursued the bandits into Missouri, but were forced to end their search when the trail became too hard to follow, but it was too late and it is possible that knowing who they were chasing, their hearts may not have been fully in it. Legend says the gang leader tossed a silver dollar to a 9-year old boy, Amos Sheets, and told him to tell the crowd he had robbed the bank. The famous Pinkerton Agency was hired to follow up on the robbery. 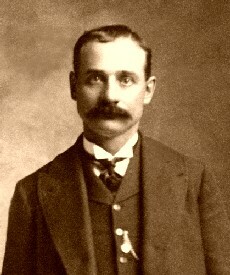 Clell Miller was later returned to Corydon to stand trial, but was found innocent because of an alibi placing him elsewhere on June 3. The James-Younger Gang continued their crimes until their defeat on September 7, 1876 in Northfield, Minnesota. Harry “Sundance Kid” Longabaugh. Most of the robbers were very gentlemanly, according to Jones. The man himself, Butch Cassidy, was not seen at the robbery. This was not the Wild Bunch’s last train robbery. But their group picture, taken in Ft. Worth, would prove to be their undoing. Today is the birthday of a man who will become one of the major religious leaders in the west. Born this day in Whitingham, Vermont, comes from a religious family. Our birthday boy will one day take the reins of a struggling church, known as the Church of the Latter Day Saints, beset by critics and internal strife, and in a search for religious freedom from persecution – their views are not very popular with the locals – lead his people farther west on a journey to some place they can live as they want without worrying about who might be offended by their beliefs. The sad thing is, this isn’t the first time our subject had had to move out of his home territory in search of religious freedom. In 1833, they moved from New England to Ohio, but a scant five years later, they are pushed out again to the west, into Missouri, but have to move again up to Nauvoo, Illinois in 1838. In 1846, they are pushed out once more, this time settling in Council Bluffs, Iowa. Their final journey begins again and will only end in July when they reach the Utah Territory of that year. Things really start to look up for our subject and his followers in 1850, when he is named Territorial Governor of Utah, formerly named Deseret. In 1857, he obtained a contract from the United States to haul mail and freight in the territory. In 1861, he helped in the construction of the trans-continental telegraph line. Four years later in 1865, he took his 50th bride. In 1868, he helped con-struct the transcontinental railroad. He was tried for bigamy in 1871, but he was acquitted, and passed away from peritonitis at the age of 76. Who are we talking about? Happy birthday, to Brigham Young, the leader and builder of the Mormon empire.